The Tisch Multiple Sclerosis Research Center of New York (click here) recently published the Phase 1 results of the first-ever FDA approved multiple sclerosis regenerative stem cell study (click here). The results created quite a buzz in the MS community, as the headline results stated that 70% of trial participants experienced increased muscle strength, and 50% saw improved bladder function. As the study included only patients with progressive MS, many of them with advanced disability, these results seem especially impressive. 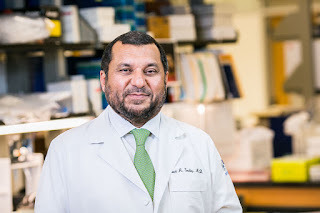 Given the level of interest in this trial and stem cells in general, I thought it important to interview the man behind the study, Dr. Saud Sadiq, the Director and Lead Research Scientist of the Tisch MS Research Center. Luckily, Dr. Sadiq has been my MS neuro for the last 14 years, so a simple phone call was all that was needed to set things up. Dr. Sadiq and his researchers had been working towards this Phase 1 study for over a decade. Since the Tisch Center is not affiliated with any academic or healthcare institution, all monies for the trial were raised privately through a certified nonprofit foundation. My interview with Dr. Sadiq is quite long but full of important information, so I’ll publish it in two parts. This installment will explore the recently released Phase 1 trial results and their potential implications. The next installment will include an overview of the upcoming FDA approved Phase 2 trial, as well as a discussion of how regenerative stem cells might work and their possible impact on the treatment landscape of multiple sclerosis. It also covers some of the many different areas of groundbreaking research currently underway at the Tisch Center's laboratories. I’ll publish the second installment next week. This interview was lightly edited for readability. I’ve included some “WK Notes”, which explain in layman’s terms some of the more complicated medical jargon used in the discussion. WK: Dr. Sadiq, you recently published the results of your Phase I MS stem cell trial, and they look quite strong. To start, can you tell me about the patient population of the study? Dr. Sadiq: The patient population consisted of patients with clinically definite multiple sclerosis who had either secondary progressive or primary progressive MS. They had relatively stable disability scores – we use the EDSS scale to assess disability scores – in the years preceding inclusion into the study. Their EDSS needed to have not changed in the six months proceeded the study. Of the 20 people in the study, 10 of the patients we included used wheelchairs or had EDSS of 7.0 or above, and another 10 patients had an EDSS of between 3.5 and 6.5. The majority of patients were in the more disabled category and were using aids such as canes or wheelchairs. WK: Why didn’t the study include any relapsing-remitting patients? Dr. Sadiq: Well, remember, this was a Phase 1 trial that was designed primarily to assess safety. Relapsing-remitting patients tend to do well with disease modifying treatments, so evaluating recovery would have been much more difficult, even though this wasn’t a primary focus of this trial. WK: You mentioned disease modifying drugs. Were the patients chosen for the study on disease modifying drugs, and if so, did they continue them throughout the study? Dr. Sadiq: Yes, most of the trial subjects were on the drugs we commonly use to treat MS, including Tysabri, Rituxan, and intrathecal methotrexate (WK note: intrathecal (spinal) injections of methotrexate is one of Dr. Sadiq’s preferred treatments for patients with progressive MS. He also treats many of his progressive MS patients with Rituxan). WK: What was the age range of the patients? Dr. Sadiq: The youngest patient was in his 20s, and the oldest were in their 60s. WK: Let’s talk about the type of cells that were used. These were not raw mesenchymal stem cells, which are the most common type of cells used in other stem cell trials and in for-profit clinics, correct? Dr. Sadiq: That’s right. Basically, in our laboratory, we take a patient’s bone marrow and separate out the mesenchymal stem cells. We then purify and clone them, and then freeze them for use in subsequent treatments. The cells harvested from one bone marrow extraction – we harvest from the breastbone – can be used for multiple procedures. Before the actual treatment, the cells are then grown to about 100 million mesenchymal stem cells which we then convert into neural progenitor cells, cells which are committed to a neural lineage (WK note: neural progenitor cells are stem cells specific to the central nervous system). We usually get between 5 million and 10 million neural progenitors, and that’s what we inject into the spinal fluid of the patients. WK: What exactly are neural progenitor cells as compared to raw mesenchymal stem cells? Dr. Sadiq: Mesenchymal stem cells have the ability to differentiate into several different types of tissues. They can turn into fat cells or cartilage cells, but they can also differentiate into heart cells and liver cells, among others. Because we were injecting cells directly into the spinal fluid, we wanted to commit them to neural lineage so they would not differentiate into other kinds of tissues once inside the patient. WK: I understand that the transformation process that turns mesenchymal stem cells into neural progenitors is something that was developed exclusively in the Tisch Center’s laboratories? Dr. Sadiq: Yes, we published the process in a number of papers. The details of the differentiation process were detailed in these reports. WK: So, the details of this process aren’t a secret, they can be replicated in any stem cell laboratory? Dr. Sadiq: Yes, between this paper and previously published papers all of the details are available. WK: To your knowledge, though, the Tisch laboratories are the only ones using this process? WK: Let’s talk about the treatment protocol that was used in this Phase 1 trial. How many stem cell treatments did the trial subjects get, and at what time intervals? Dr. Sadiq: In this Phase 1 trial, we used three treatments on each patient, and the treatments were given every three months. We used between five and 10 million cells for each treatment. So, in this trial of 20 patients, we did a total of 60 stem cell treatments, and roughly 80% of those involved the injection of 10 million neural progenitor cells. WK: How long did the study last? And was there a placebo control group? Dr. Sadiq: The trial lasted two years, and there was no placebo control group. The capacity of our laboratories at the time was a limiting factor, so we had to stagger the treatment of patients. WK: Even though the trial lasted two years, none of the patients received more than three treatments, and they all received them at three-month intervals, correct? Dr. Sadiq: That’s right, nobody got more than three treatments. WK: Okay, let’s move on to the topic that’s probably of most interest to patients, the actual results that you saw from the trial. The headlines were that 70% of the patients are an increase in muscle strength and that 50% saw improvement in bladder function. Could you give us some details on those numbers? Dr. Sadiq: I think the main thing that has to be stressed is that the study was designed to look at safety and tolerability because nobody in a trial setting had previously injected stem cells multiple times at regular intervals into patients. We really had to establish safety and tolerability. We did this successfully, as all patients received all of their treatments and tolerated them well. There were no adverse effects except for very mild headaches and fever, which were transient and generally didn’t last more than 24 hours. There were no hospitalizations and no deaths, and this safety profile was really the primary purpose of this Phase 1 study. As to the question of efficacy, we have to be very careful because this was not a placebo-controlled or blinded study, and most of the patients expected that they would get better. What we did see when assessed by muscle exam using the standard assessment tools – which were performed by a neurologist who wasn’t involved in the administration of the cells – was that 70% of the treated patients did see an increase in muscle strength in at least one muscle group. In addition, 50% of patients had significant bladder function improvement. WK: Did some patient groups appear to respond better than others? Dr. Sadiq: Yes, although patients did tend to improve across the board. Not unexpectedly, the less disabled they were, the more likely they were to improve. Overall, the less disabled did better than those with higher degrees of disability. Also, the secondary progressive patients tended to do better than the primary progressive patients. But remember, these were very small numbers, only a total of 20 patients of which only four had PPMS. But generally, we saw a drop off in response rates in patients with EDSS 6.5 and above. WK: Why do you think there was this drop-off in efficacy seen in patients with EDSS 6.5 and above? Dr. Sadiq: I think the integrity of axons is probably a key factor in whether they will rehabilitate or not. If you still have an electrical connection, it’s easier to repair, and scar formation from lesions probably also impedes repair. The less structural damage there is, the easier it is to repair the problem. WK: What are your thoughts on repairing the damage of patients with higher levels of disability, who currently must rely on wheelchairs? Dr. Sadiq: I think these are our hardest challenges. Once we can figure out how to eliminate scar tissue in the central nervous system, that will really open the door (WK note: scar tissue is created by the damage done by long-standing MS lesions). At one point we were using enzymes to try to eliminate scars. Once we can understand not just remyelination but also the regeneration of axons, I think that will be the way to achieve the goal of restoring function in more disabled patients (WK Note: axons are the long threadlike part of a nerve cell along which impulses are conducted from the cell body to other cells). That’s why we are so focused in our lab in trying to figure out primary progressive multiple sclerosis. WK: Were any of the patients complete nonresponders? Dr. Sadiq: Yes, there were. Some of the PPMS patients as well as some of the more disabled SPMS patients. WK: You mentioned the lack of a placebo-controlled group. I’d like for a minute to discuss the placebo effect because many patients don’t, I think, have a very good understanding of what the placebo effect actually entails. Many believe that when improvements are attributed to the placebo effect that these benefits are being disparaged as imaginary or “made up” by the patient. Could you comment on the science behind the placebo effect? Dr. Sadiq: The placebo effect is real. It’s scientifically shown to be real. Even in cancer trials, whatever the mechanism, it’s real. It’s not simply psychological. It’s a conviction where the patient thinks they are going to get better and somehow that has a physical impact. Now whether the brain produces certain well-being cytokines or humoral factors or if you get an endocrine surge, somehow that has a positive effect that we still don’t fully understand. Since the late 1950s, the placebo effect has been recognized as a genuine phenomenon. In fact, there is a case of a cancer patient who got cured even though they had been given a placebo and not the drug being tested. So it’s not just some insignificant, mild effect. Generally, it’s considered that in any study without a placebo arm there’s about a 30% effect that can be attributed to placebo. This is real, when the patient is hopeful, the patient often feels better. The thing about our study which is encouraging and leads me to believe the improvements we saw are not all attributable to the placebo effect is that we saw the most improvements in the patients that were the least disabled. This is something you would expect to see in a double-blind trial. In our trial, we probably chose the worst patients to study in that they had the disease for many years and most of the patients had significant disability. Our mean EDSS was 6.8 at baseline. Our average disease duration was about 18 years. These are never the patients who are chosen for pharmaceutical company studies, who are generally much less disabled and have shorter disease duration. The patients we used actually stacked the study’s chances against getting any positive effect. WK: Just to be clear about EDSS, what’s the difference between 6.0, 6.5, and 7.0? Dr. Sadiq: 6.0 is somebody who needs a cane to walk, 6.5 is somebody who needs bilateral assistance like a walker or bilateral crutches, and a 7.0 is a somebody who requires a wheelchair. WK: In the trial, what kind of results did you see in patients who were EDSS 7 or above? Dr. Sadiq: We saw two patients who had not been able to take more than a step or two who after treatment were able to walk with a walker for 25 feet. Whether that was placebo or not, I don’t know because this level of effect hard to explain. This was out of 10 patients who needed wheelchairs. It’s certainly intriguing. WK: So two out of ten patients who hadn’t been able to ambulate at all and were entirely reliant on wheelchairs before the trial were able to walk with the aid of a walker for 25 feet after the study, correct? WK: Well, placebo or not, that seems like a remarkable result. Dr. Sadiq: Yes, but we need to see if similar results are seen when we do the Phase 2 trial, which will be specifically designed to assess efficacy. I hope readers have found Part One of my interview with Dr. Sadiq useful and informative. Look for Part Two next week, in which the Phase 2 study and just how the stem cells might work are explored. We’ll also talk about some of the other research currently being conducted in the Tisch Center’s laboratories. I've been wondering about this...eagerly await part two of your report, not to mention Phase II of the actual trials. Thanks, Marc, that the information comes from you and Dr. Sadiq means I can allow myself to feel at least a glimmer of hope that something really productive will happen. Thanks Marc. Following with great interest. Marc you are THE BEST! Thank you very much for making an effort to keep this blog, which is, for me, the best source of important, meaningful MS news! Thanks so much for your very kind words, Dragana. Much appreciated. So much of the research reported is, well, garbage, that I've stopped commenting on a lot of it. Decided to concentrate only on truly innovative approaches that might revolutionize the treatment of MS. Won't say much about "me too" drugs or trials that seemed designed only to increase the stock price of the companies reporting them. "Me too", Mark, about the drugs (ex. CRAB's) offered over the last 30 years since my diag. in 1983. $$$$$ for the manufacturers. I think they called it the CASH COW. As you can tell - I'm a bit more than cynical. Thanks for putting this info together for us. We appreciate all you do! The transplant of neural progenitor cells in patients with progressive disease is a breath of fresh air in an era of immuno-modulating drugs that are restricted to the periphery and not the CNS. It will be interesting to see if the microenvironment inside the CNS is altered to an extent that will allow for endogenous (self repair) processes. Many thanks to the hard working scientists at Tisch and to you Marc for this groundbreaking study. I hope you pass this information along to the boys at Barts in London. According to Dr. Sadiq, the cells do seem to jumpstart self repair processes. Treatment will need to be ongoing, though, since these stem cells don't address the underlying disease process. I offered to share this interview with the Barts folks, but have received no response. What is the expectation for the trial participants regarding future treatments- either the DMT they were already on or more stem cell treatments? I have been diagnosed of multiple sclerosis (ms) for 6 years now, i have used so many prescriptions fromm my doctor but never gave me a cure rather controlling the symptoms, my symptoms where ( constipation, depression, difficulty swallowing, difficulty thinking and understanding, flare, headache, heavy legs, numbness of face etc. ), my health and life was gradually deteriorating more and more, so i took a glance on the internet and i found (GENERAL HERBAL HEALTH CENTER) a HERBAL MEDICINE HOME that can cure multiple sclerosis (ms), i gave a test to their herbal product because there is no harm in trying, i bought the medicine and it was shipped to my door step and i was very happy so i used the herbal medicine (note: this herbal medicine can be use/taken along with your doctors medical prescription, if you want to) i used this herbal medicine for 9weeks the results were wonderful, i started getting good result, my symptoms was gradually going for the best, i started getting healed, i can feel that because i know how i was before i started using the herbal medicine, and in 9 weeks i was cured totally.. thanks to general health center. “I am a amateur videographer who has done the best I can at documenting my journey with PPMS through HSCT Mexico. At 52 I am the youngest of a group of 4 all diagnosed PPMS that are now one month post. The oldest at 62 and myself are EDSS 6.5. The other two were 6.0. Incredibly, 2 boys, 2 girls, that are now my forever friends and consists of one Jew, one vegetarian Atheist, one Catholic and myself the only red blooded American and is a Christian apologists. They say the infusion room has never been so lively to say the least. I do so hope we all succeed to help shine some light on the truth that is all but impossible to get in the States. May God bless the humble Mexican people for allowing us a shot at what more than a decade of clinical trials can not figure out in the richest country in the world. Marc you have been my hero for almost this entire 6 Neurologist 51/2 yr Nightmare and I hope someday to speak you for advise on what hopefully will be a well documented beautiful story for Helen, Scott, Colin and Tess. That right, I couldn’t make this or much of our unbelievable journey. Just as our initial’s are HSCT.